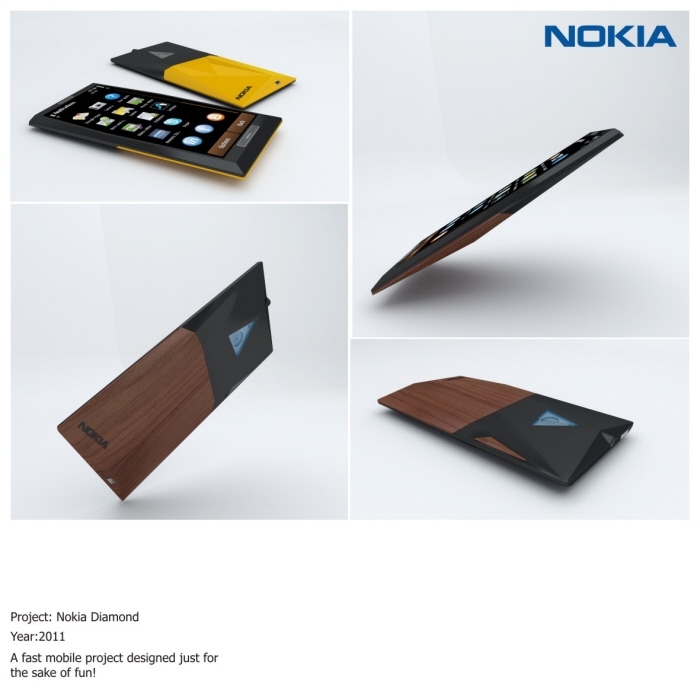 Nokia Diamond is a concept created by Richard Malachowski, from China, who envisions a device with sharp edges and corners and overall and aerodynamic and aggressively shaped smartphone. 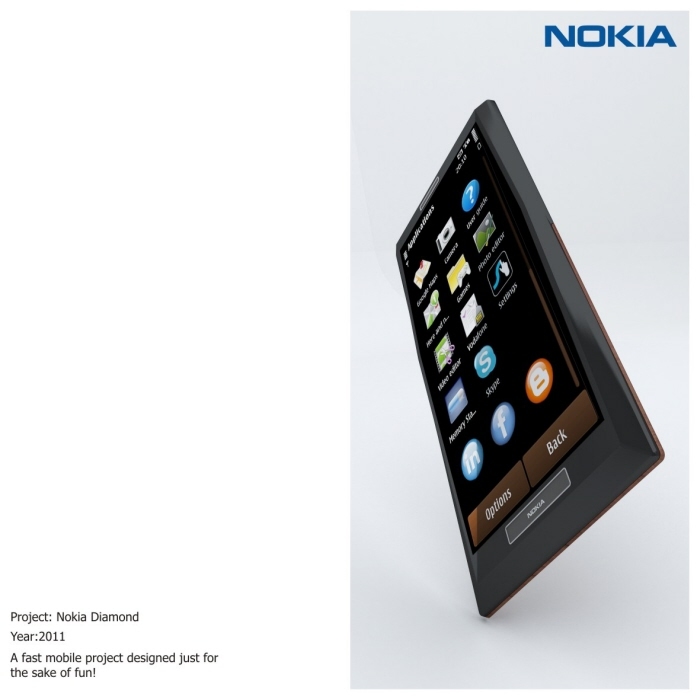 This Nokia design also involves a triangle-shaped camera sensor and a back side that seems to sport a wood surface. The device may have the many corners of a diamond, but still it’s able to sit right on a flat surface. With so many corners on the Nokia Diamond one would expect it to sting the user’s hand, to be honest. Also, it can feel a bit uncomfortable in the palm of the user, but at least it’s unique in form factor and it looks very light and slim. I have no real specs for this model, so I suppose we’re dealing with a 4 inch touch display smartphone with Clear Black AMOLED technology, Symbian Belle or MeeGo as the OS of choice, 1 GB of RAM, a 1GHz processor and a 5 or 8 megapixel camera at the back. The volume buttons on this baby also seem to be wooden, just like the battery cover, while the rest of the phone might as well be polycarbonate. 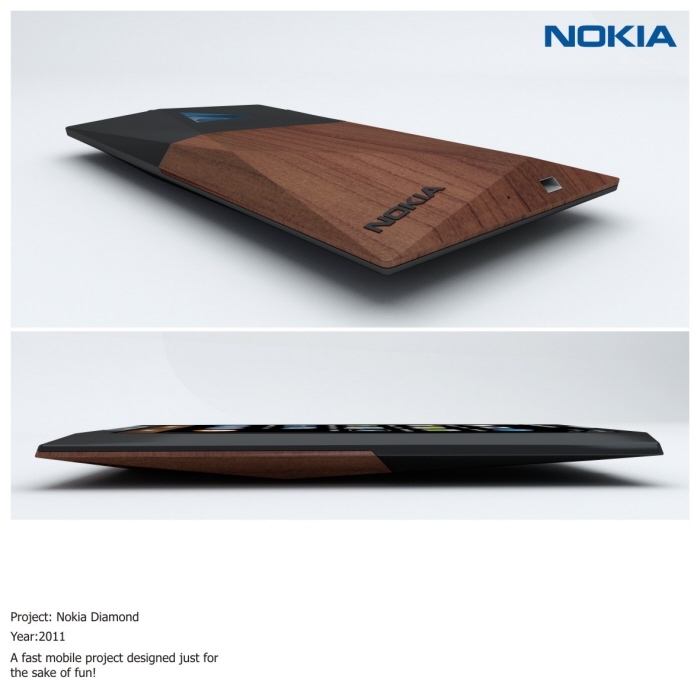 Of course, the wood-like side can be an imitation, but I doubt Nokia would resort to such materials. In the end I see this as a fashion phone, considering its shape, name, materials and form factor.